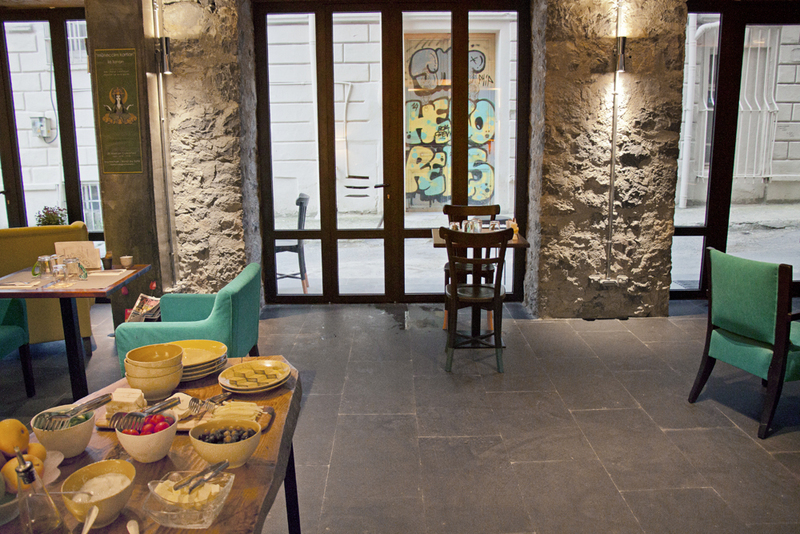 The hotel recently opened its doors in May 2015 in the up-and-coming Karaköy neighborhood. It is the second born of the creative owners of The Sofa and is one of the most exciting mid-range boutique hotel options I have stayed at. 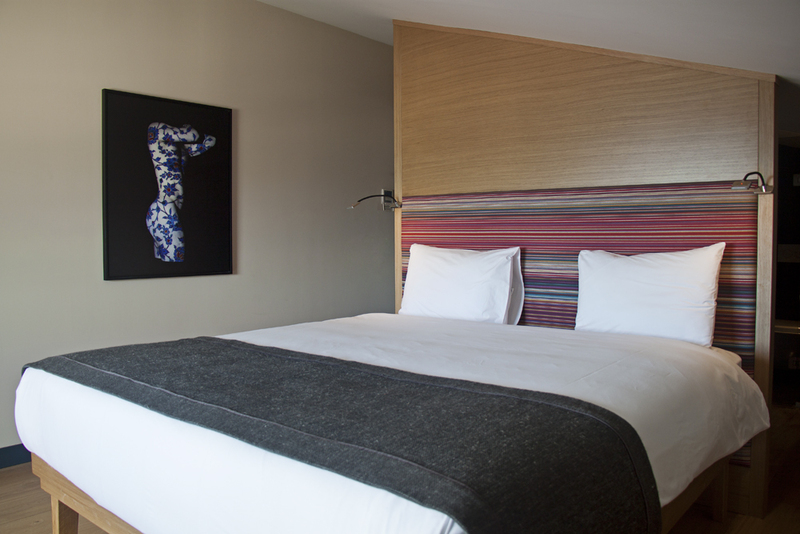 The hotel offers a mix of urban cool, luxury and playfulness and caters to a crowd of trendy and young design aficionados, as well as couples, single and business travelers and families alike. 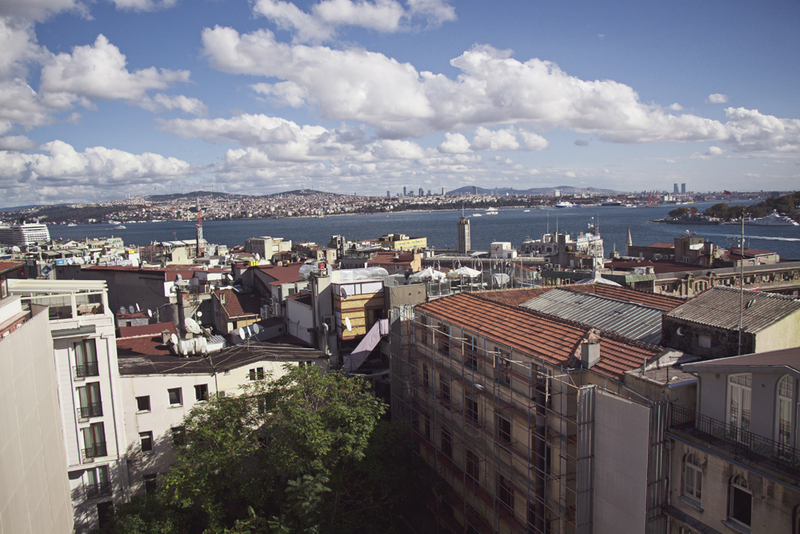 The refurbished building is located on a peaceful side street not far from Galata Tower and was once abandoned and used as an underground graffiti and street art exhibition center. Much of this underground vibe remains today, albeit a much more polished and cozy version of it: the décor is tasteful with exposed brick walls, concrete columns, natural stones and wood floor and there is a resident local artist presenting his work in the Café and Lounge areas. 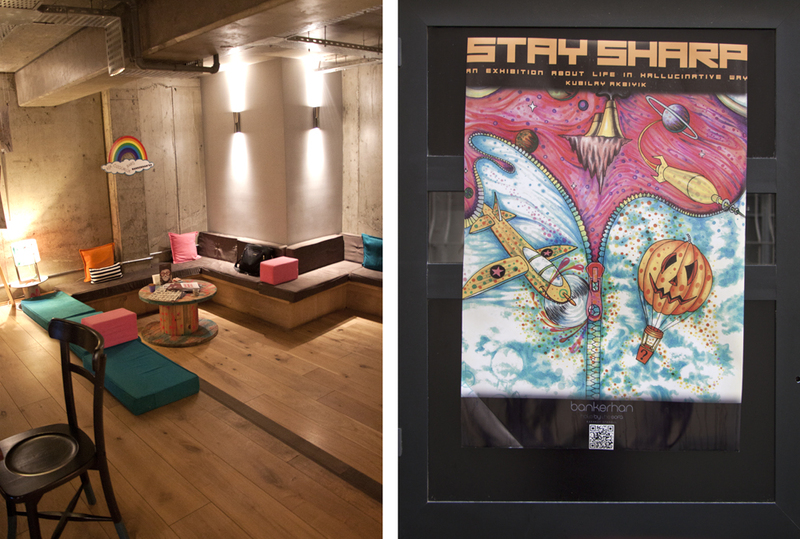 The first glance into the hotel exudes hip coolness to no end and is right up my street. 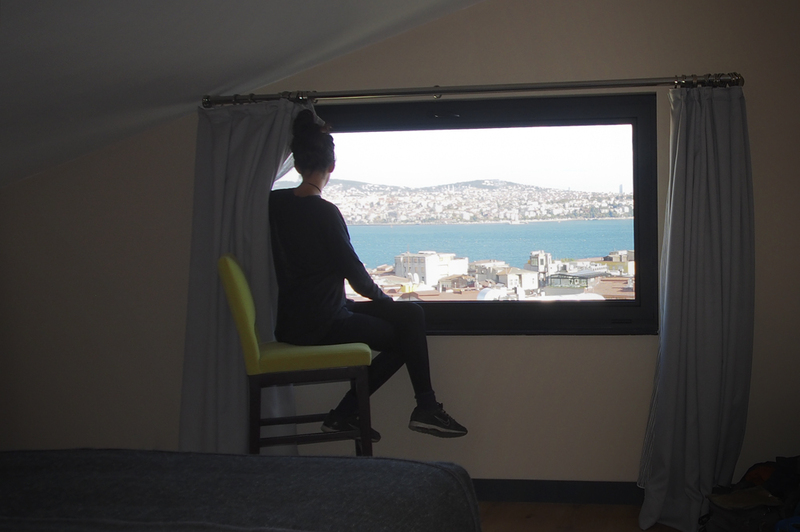 My room at Banker Han is located on the top floor and is quirky, comfortable and offers the best view I have seen of Istanbul so far, looking over the Bosphorus and the Old Town. The sunset is simply breathtaking and there is a chair conveniently placed right by the window to linger and daydream over this wonderful cityscape. My room is surprisingly large and has a super comfy bed with scrumptious white linens, fluffy pillows, modern furnishings and tasteful decoration – I love the photograph of the projected Iznik tile pattern on a naked body on the wall, it is gorgeous. 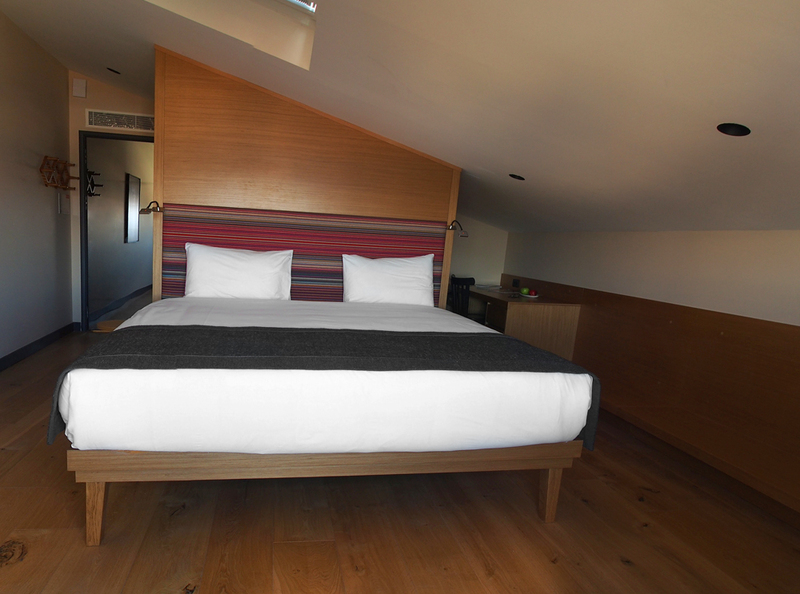 All in all, it is a super sleek room with a lot of charm and warmth, wooden floors and modern furnishing. 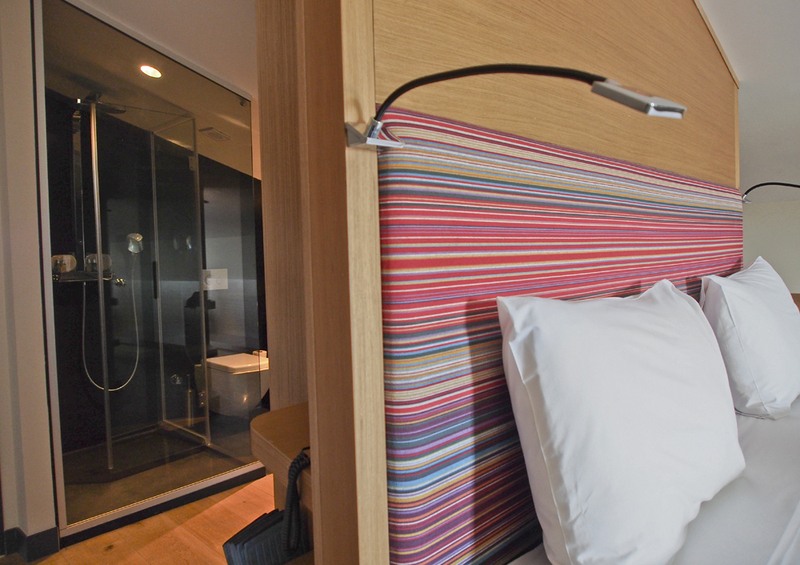 As you’d expect from a recently opened hotel, everything is new, crisp and clean. 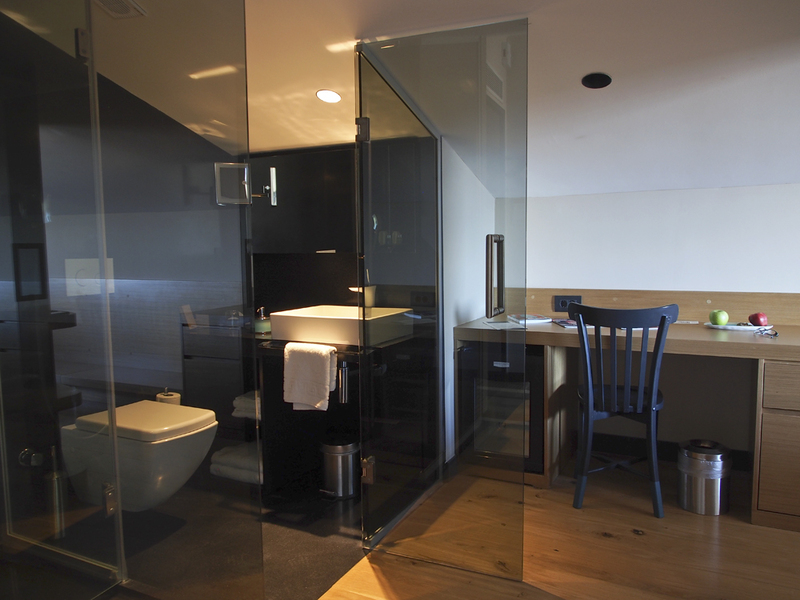 The quirky bathroom has only glass walls, but it is located behind the bed with a small separating wall, so none-exhibitionists fear not – and voyeurs rejoice! I kid. But peeping Tom jokes aside, the rain shower is absolutely heavenly. The room next to mine has a huge outdoor balcony and other rooms are a little smaller and more like little lofts, with Japanese style beds low on the floor. Some bathrooms are also fully closed if you’d rather that. There are a total of 36 rooms of all shapes and size at Banker Han for all budgets, all with the same sleek and hip elegance. Other amenities include electric blinds, USB ports by the light switch, big TV, room safe and fridge. I was welcomed with water, fruits and nuts on my desk, which was lovely. 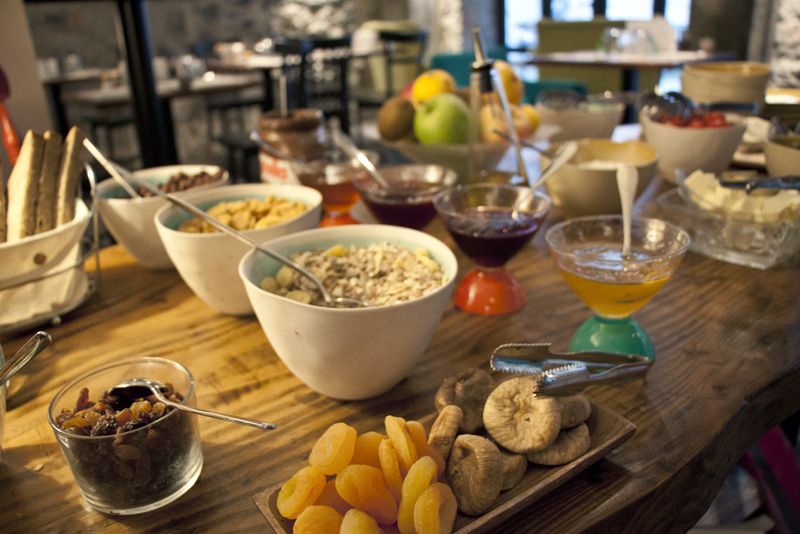 The complimentary buffet breakfast is simple but varied, filling and most importantly vegan-friendly, with a great selection of bread, jam, fruits, nuts, vegetables and free-flowing tea and coffee. 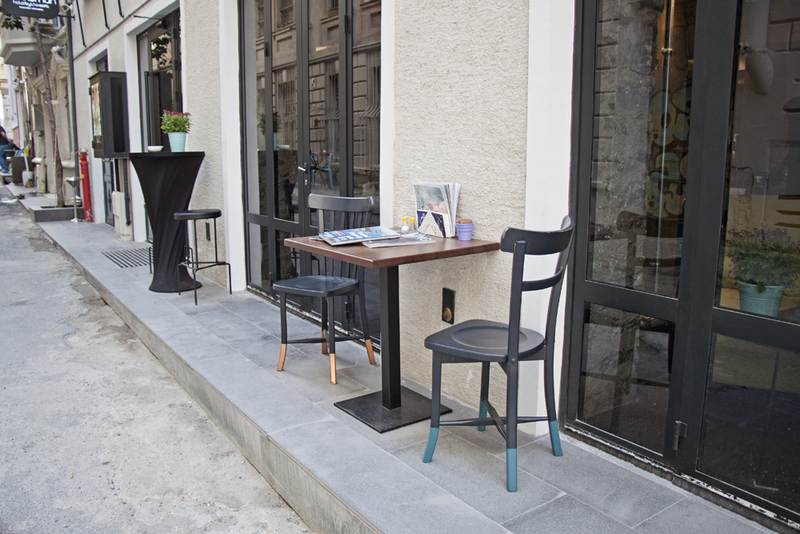 It is served in the lounge area which opens onto the street and is conducive to meeting the cool crowd that visits Banker Han while lingering a while over a few extra cups of tea, watching life slowly go past the window and admiring the graffiti across the street. I haven’t tasted the restaurant’s menu for other things than breakfast, but the lounge area was a lovely place for me to hang out and do a little bit of work and I was surprised with a complimentary cup of tea by the lovely staff on a few occasions. Which leads me to my next point – the staff at Banker Han are literally the sweetest I have ever met. I was made to feel like home from the moment I stepped in and it felt more like staying at a friend’s gigantic home rather than another factory-made hotel. The manager Sandra is truly a gem and she gave me great recommendations on what to see and do around town – and, echoing with the hotel’s underground vibes, her recommendations were spot on and off the beaten path. I didn’t want to leave! Istanbul is an exciting city to explore and Banker Han is such a wonderful mid-range option that you’d wonder why bother paying extra money for any other type of accommodation. The Wi-Fi was at time a little patchy in my room the sixth floor, but it worked at charm in the lounge, and that is where I did most of my work, so it wasn’t a problem for me. As an added bonus, pets are also allowed, but unfortunately there was no puppy in sight during my visit. There’s always next time! Many thanks to Banker Han by The Sofa for their hos­pi­tal­ity. As always, all opin­ions are my own regard­less of who is foot­ing the bill. How charming! I love Istanbul and will add this hotel to my list. Wow, that Hotel looks amazing. Except for the glass walls of the bathroom. What’s up with that? If you are alone or with your significant other, ok, maybe. But if you are staying with friends or family? Have I spent to much time in the US to find that weird? Lol 🙂 Anyways, I think this is quite a cool hotel and I would love to check it out! HAHA! Yeah, I read some funny comments about the bathroom on Tripadvisor. For me it wasn’t a problem, but I can understand how it could be a little embarrassing for people that are not super intimate. Sounds very bohemian chic. I think it would be my kind of place. I was in Turkey this past summer. You mentioned how wonderful the owners and staff were to you. I found the Turks generally delightful. How charming. Love the decor! A great find and worth checking out further. Thanks for sharing!! Always love mid-range options; they deliver the best value. 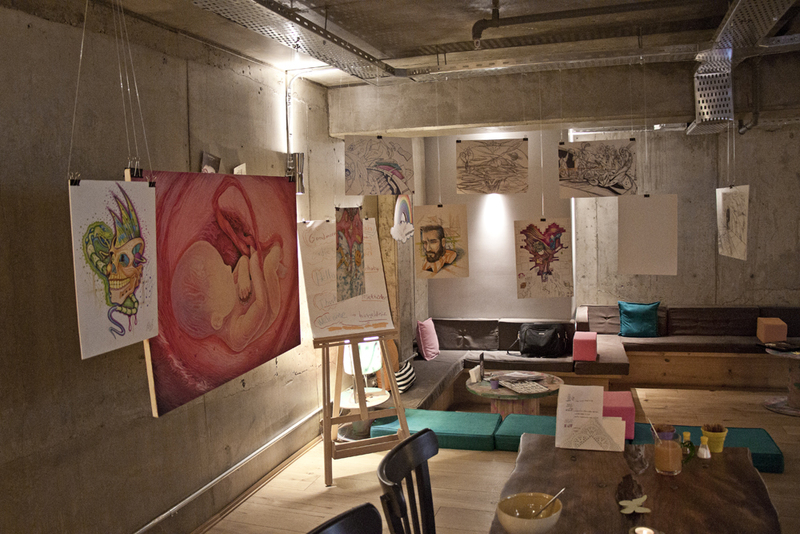 And boutique hotels are always interestingly set up, just like this Hanker Ban. It looks so charming and cozy! Looks like a great place. How did you find the neighborhood in terms of access to transportation to other parts of the city? It was great! It was just a 2 minute walk from the Galata Tower, smack in the center of things. What a beautiful hotel. I love the artsy eclectic vibe. Looks very nice and modernly decorated. Really like the photography. It’s essential to showcase a good hotel. Also, those views are quite something! 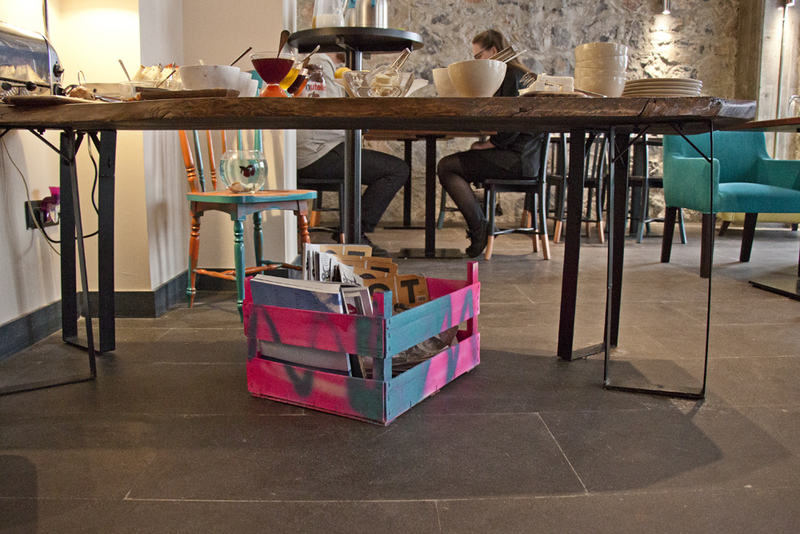 Great design, a friendly staff and a yummy breakfast? THe Banker Han has everything I look for in a hotel. Bravo! Looks very artsy and up-scale! 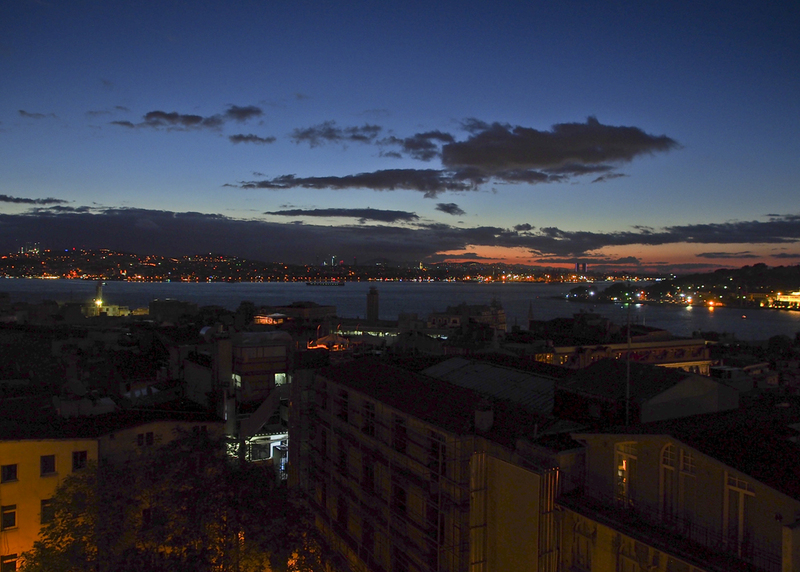 We loved Istanbul and it is such a great place to experience. I’ll never forget getting woken up to the call to prayers for the first time! Okay, saving this for whenever I make it out to Istanbul. Love that view and the breakfast looks delicious. Thanks for sharing. It looks lovely, and what a nice touch to be greeted with a cup of tea. I travelled around Turkey solo awhile back and I think personal touches at hotels make all the difference. I’ll bookmark this one for my next trip.